iRobot, makers of the beloved Roomba lineup of robot vacuums, announced its official Black Friday sale last week and the star of the show is the Roomba 960. This flagship model is a $700 beast that does it all, and iRobot announced that it would cost just $500 for Black Friday. But wait! A twist came when we told you that Amazon actually has iRobot’s Black Friday sale price beat by $50, so you’d have to be crazy to buy it from anywhere else. Of course $449 is still a hefty chunk of change and not everyone is willing to part with that much for a robot vacuum. If you want a Roomba that has many of the same features as the 960 but you’re hoping to spend much less money, you’re in luck. 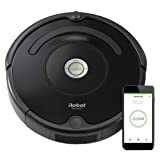 From today through the end of the day on Cyber Monday, Amazon is offering the iRobot Roomba 675 Robot Vacuum with Wi-Fi Connectivity at its lowest price ever. It features great suction for solid performance on hard flooring and low-pile carpet, and it also has Alexa compatibility so you can control it with your voice, just like the more expensive Roomba 960. This deal could definitely sell out though, so get in on the action while you still can.